I kept seeing chocolate zucchini recipes on pinterest and I finally broke down and made one. Last year I also fell victim to the chocolate zucchini combo when I made these whoopie pies =). I’m nothing if not predictable I guess haha. Originally, this recipe was called brownies, but mine turned out a little too cakey to be called brownies, in my opinion. Thus, my renaming it “brownie cake” ;). Whatever you call it, it’s good! 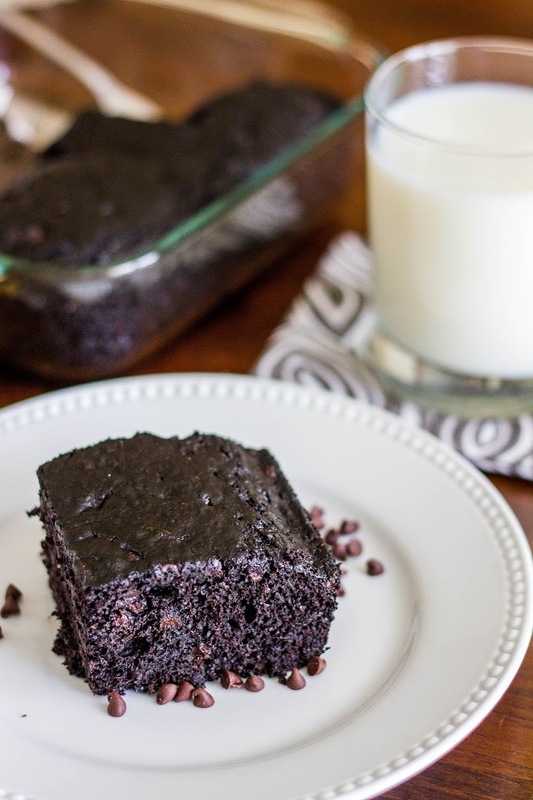 Very chocolatey, moist, and fudgey – with no oil or butter and whole wheat flour! You can eat a good sized piece (1/9th of the pan) for only 230 calories – and it doesn’t taste “health-ier” at all. I’m sure it would be even better topped with some chocolate fudge frosting though…and maybe some ice cream ;)! If you love chocolate – and who doesn’t?!? – you should definitely give this recipe a try. And if you love zucchini – or even if you don’t! – you should also try some zoodles. I was skeptical at first too, but trust me. Have I ever led you astray?? =) Enjoy! 1. Preheat the oven to 350°F. Spray 9 inch square baking dish with non-stick spray. 2. In a bowl, combine the eggs, vanilla extract, sugar, salt, and the applesauce. Whisk the flour and the cocoa powder into another bowl. Add the baking soda. Mix well. 3. Add the egg mixture to the flour mixture and combine until the dry ingredients are mixed in well. 4. Add the grated zucchini and the chocolate chips. Mix once more. Pour the batter into prepared pan. Bake for 30 to 35 minutes, or until a toothpick inserted into the center comes out somewhat clean. How I Ate My Way Through Baja California!